It’s been over two months since I’ve posted. My family and I have been out of town. A lot has happened this summer. Our summer was busy traveling from youth camps to family camps and a family vacation. We saw family out of state as well as took a long awaited trip, the one I kept putting off because I was in graduate school. I promised Margo that I would go on any vacation she planned. It was the least I could do to thank her for supporting me through doctoral studies. The trip she planned was in our family van, pulling our camper trailer. It was a two-week road trip to Yellowstone. From Chicago across Wisconsin to Minnesota, South Dakota, Wyoming and Idaho. We traveled through 10 states in all. We saw the Badlands, Mount Rushmore, the Crazy Horse Memorial, Yellowstone Park, and the Grand Tetons. There was incredible beauty, much of which is documented on Facebook. But among the memories I made is an epiphany driving through the West. At some point in South Dakota, something I knew in fact became profoundly real to me. It changed how I view myself and America in light of driving through American history. Driving across the highways that crisscrossed the prairies of the Oregon trail, by Reservations and Native American roadside exhibits, by battle sites of Americans’ drive West, I began to think about race and the fact of my whiteness really sank in. The epiphany, something I already knew but gained new meaning for me, was this: There is no such thing as a white-skinned American in terms of America’s indigenous history. I was driving across vast lands populated by First Nations peoples and thousands of bison just 150 years ago. I was struck by how much I felt a stranger there. I became very self-aware about our being a white American family, with two kids, in a van towing a trailer. I thought about this against the memories of the Native peoples that once inhabited there. Thinking about the all-American road trip we were on became a little much for me. It was as if the Spirit of history spoke through the land to me. From the central America to the Alaskan Inuit, America is a land of dark-skinned peoples. I, the white man and his family, am the stranger here. Measured in millenia, I was. Race is difficult to talk about for Americans. As an American with white skin, I find most white Americans deeply resist, or outright protest, any real talk about race. Yet, to refuse to talk about race severely limits our ability to understand history. It can even make it impossible. Race is so much more than skin color and racism is not mere personal prejudice. Americans did not discover race in the 1960’s and swiftly eradicate racism by the civil rights movement. Far from it. Race is a logic-structure that shapes America and all periods of American history. We still live in shadow of race today. Many Americans believe race is simply a matter of politics, but it is much more. Race is historically deeply influenced by 19th century science. The differences between the “races” were empirically verifiable to 19th century scientists, in a time when colonialism assisted science and its quest to catalog and categorize the entire world, including human beings. Influenced by Darwinian science, race helped early science shape the logic of evolutionary development in Western history. European scientists, of course with consent of their governments and philosophers, viewed white-skinned Europeans as the highest point of natural development. They thought white Europeans were the most developed in terms of cognition, use of reason, instrumental use of nature, culture and self-government, as well as physical features. If you pay close attention to images of beauty, power, and desirability today, the effects of this racial logic is still recognizable. As I drove across the West, I couldn’t help but think about the history of how I got there – how I was able to drive freely (and so quickly!) across the vast western prairie to the Rockies. I traveled in relative comfort compared to early Americans, who traveled under tremendous risk for months. I thought about the violent history revealed in the story of the land. I thought about how the image of America became both white and middle-class in little over a century. Race played a decisive role in a violent and tragic history. I, now, live on the southside of Chicago. Here, I am the racial minority. Chicago is a racially segregated city. While there is a large population of African Americans in Chicago, Chicago’s southside (Sox country!) is historically black. More African-Americans live in Atlanta than Chicago (as I recall from a recent NPR program). 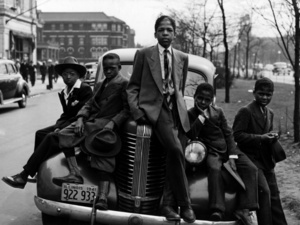 Nevertheless, Chicago is still, arguably, the black capital of America by many measures. It is the home of Louis Farrakhan, the Nation of Islam, Jet magazine and Ebony. The neighborhood I live in on the southside is a pocket of wild diversity because the University of Chicago and five mainline seminaries attract a wide array of people. Still, as a southsider, almost all the professionals I see are African American: my dentist, doctors, pharmacist, insurance man, and veterinarian. I am not naive enough to believe I know what it means to be a racial minority. In fact, I am a racial minority here because it is my choice to live here. I live, shop, and worship on the southside of Chicago. But, I am also reminded how much my race is a decisive factor of me being here. It shapes my choice to live here or not. One thing I don’t hear from the Right, and only a little of from the Left, is how much race is an enduring reality in America. Politically and economically, America remains deeply shaped by race and racism. Despite our election of America’s first black President, the current recession is partially defined by high national unemployment rates that reflect the changing state and nature of our economy. These unemployment rates resemble what unemployment has been for African American men and other racial minorities for decades. Why wasn’t America in a crisis, then? Exactly, whose America is in crisis? When we say “America,” whose America do we mean? I believe the current rage against government and the ideological campaigns to reclaim America can also be considered in light of race. Again, race is much more than skin color. Liberals are blamed for rewriting American history because intellectual honesty requires that we accept the phenomenon of “winner’s history.” This is the fact that history is written by the winners and is shaped by that perspective. In America, the winners can still be racially defined. While Obama is labeled a Muslim (something much less believable if Obama was white), “his” government is being blamed for economic decay and taking away American freedoms. I can’t help but wonder how race shapes these politics? Whose America is under threat of being lost? I don’t believe America can talk about “recovery” without talking about race. In addition, if Americans are ever going to share a sense of history, we must begin to acknowledge racism and the enduring perspective of race. As I drove across America’s countryside, I realized there was no white-skinned American before Europeans claimed America for themselves. Listening to politics today, the debate about who claims America lingers on. After 300 years of slavery, the conquer of First Nation peoples, annexing parts of Mexico, immigration debates and ongoing economic disparity between races in America’s cities and countryside, Americans will continue to struggle about race and racism because it goes to the heart of who we are.